We are a window cleaning agency serving Blackheath SE3 and a few surrounding areas. Our objective is to make windows streak-free and shiny. We work using the best cleaning products and equipment. Our technicians are insured, licensed and experienced. 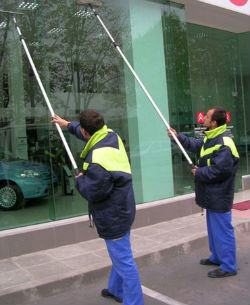 We spend as much time as we need in each property and work continuously to get all windows spotless. Our working hours are extended; you can book for the weekend if you want. We work to a high standard. We would love to hear from you. Do you need a service? Give us a call at once. If you are looking to get your windows sparkling, it is essential to use our window cleaning service in Blackheath, which always gets satisfactory results. Here you will come across qualified specialists who always do a fantastic job. We take window cleaning seriously. We ensure a safe work environment for both our work force and our customers. This means that we provide all the products and equipment necessary for every cleaning session. Additionally, we always discuss customers’ preferences beforehand and we treat every individual well, paying special attention to everything they say. We are caring and diligent. Not only that, but our cleaners are specially trained on window cleaning in SE3. This is essential since the job requires precision, skills and experience. Rest assured your windows will be rid of stains, grime, dust and streaks in a professional manner. We offer a worry-free cleaning system, which is there to accommodate your needs. We are at your service. We believe we can work out a great cleaning plan for your windows. If you take interest in our service, it might be best to get in touch with us as soon as you can and let us know your needs. We will adjust to your schedule. Make a call.